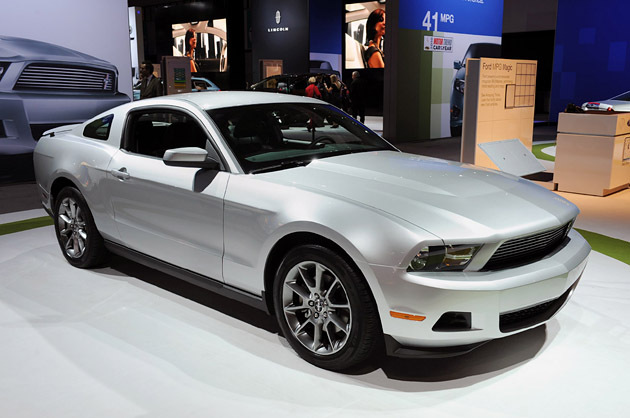 We gound a pretty cool article and video about the the new 3.7L V-6 in the upcoming 2011 Ford Mustang. We at Waldorf Ford are plenty excited to start getting these refined hot rods in our hands. Stop by and see us at Waldorf Ford and ask us about it. The 2010 Ford Mustang was by all accounts a pretty significant refresh compared to the 2009 model, with a vastly superior interior, better ride and handling and, some would say, improved outward aesthetics. But there was still something missing. The Blue Oval used carry-over powertrains, and in the case of the 210-horsepower V6 model, nothing changed. For the 2011 model year, Ford is rectifying that mistake two-fold. The 5.0-liter V8 gets a great deal of press for its impressive 412 hp and 390 pound-feet of twist, but many members of the Autoblog team are just as excited to get their hands on the new 305 hp, 280 lb-ft 3.7-liter V6 offering. We’ll likely have to wait a bit longer to curb that urge, but the folks over at Motor Trend have already been given a taste. MT‘s Arthur St. Antoine was invited to Ford’s Arizona proving grounds to spend some seat time behind the wheel in the passenger seat of the updated ponycar, and though he didn’t get to drive he liked what he experienced. St. Antoine calls the new V6 mill “plenty strong,” adding that the engine is smoother, stronger and sounds better than the outgoing 4.0-liter six ever could. After some gentle strolling around Arizona, St. Antoine meandered back over to the proving grounds for some laps in a Performance Package V6 model with vehicle dynamics engineer (and Top Gun-level driver) Jamie Cullen. From the perspective of the right seat, the 3.7-liter Stang reportedly was able to handle anything thrown its way with flat cornering, strong braking and near constant contact between the tires and the track. Head over to Motor Trend to read the report from the passenger seat. This car is amazing! It looks like it's gonna eat those old cars out today. I'm sure this kind of car needs high end auto detailing products and regular lucrative maintenance.